Waipari is above all else a unique hunting experience. 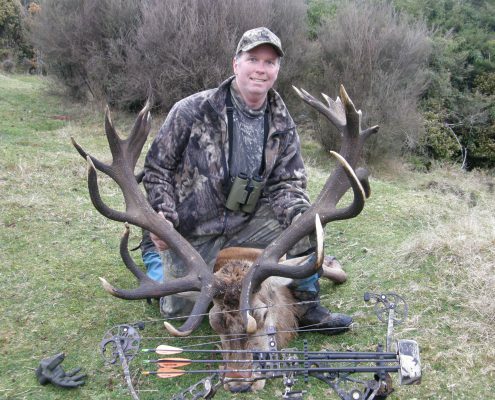 March – July is hunting at its best in NZ. Superb trophy animals, 12 – 20 pointers present an irresistible challenge. The terrain provides a variety of opportunity from steep faces to grazing flats to view and prepare for your trophy shot AND capture some of the most precious memories ever to be made. As a guest of Waipari you will be hosted by qualified guides who are members of SCI, and all have extensive experience at hunting in New Zealand bush environments. All have a passion for hunting and the preservation of natural environments, to ensure the continuation of hunting throughout NZ. The thrill of tracking trophy animals for our guests is part of the enjoyment, and sharing it with others is what Waipari is all about. Other wild trophy animals include fallow bucks, wild ram, goats, turkey and ducks (in season), hares and rabbit – all in abundance. Hunt exclusively and safely on 10,000 acres of Waipari native bush, surrounded by Tongariro National Park – this is true hunting New Zealand style. 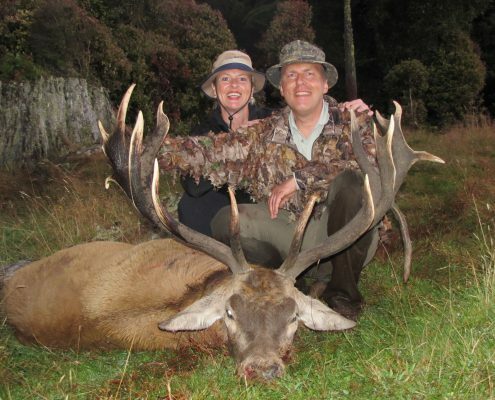 Waipari specialises in free range hunts of traditional stags in New Zealand. Our Red Stags, range from SCI 280 to SCI 360 – in some years we have an exceptional SCI 380+ score. Our hunting animals are characterised by natural native forests, rivers and this makes your experience very unique. This part of New Zealand is where you will see the very best of our native forests. Our standard price for a Red Stag, in the range above is USD $6000 including three nights accomodation, food, and private hunting guide. Fallow Stags, are USD $2500, Arapawa Rams USD $1,000 and South Pacific Goat USD $500. Other species including Sambar, Rusa and Sika can be arranged. Turkey and small game hunting is available upon request and can be incorporated into your trophy hunt. If hunting Red Stag, it is the responsibility of the hunting guide to judge the stag score correctly and if stag taken scores higher than estimated by the guide the client will not be required to pay additional trophy fees. All prices include NZ government 15% Goods and services tax. All costs are quoted in US Dollars. Waipari will arrange for the preparation and expediting, of your trophies through our professional taxidermist and shipping agent.